Some things have been coming in between since I posted the first work in progress of this image. I haven’t had any time to work with it since. Anyway, today I found a few hours, to continue the work. 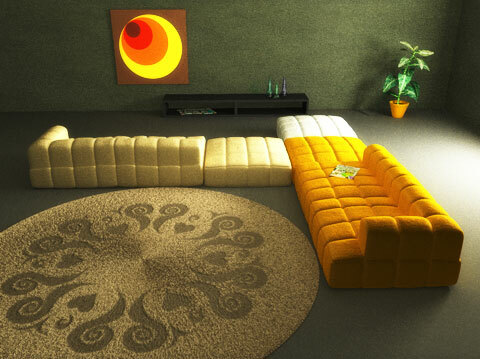 Tweaked the sofas and the rug and added a painting, a plant, a shelf, some magazines. And also did some work on the texturing and lighting. I guess this project is quickly coming to an end. Well, I really have some other things I wanna sculpt and paint right now. Interesting that sometimes I can sit around and tweak and adjust things for days, and sometimes, like in this case, a project only needs a few hours to get a decent result that I feel I can stash away in the pile of finished work. I will post the final image in the portfolio (Wohoo, for the first time in years) as soon as I’ve done the last adjustments and produced a final render.